Many of the books on your shelves are important. They have been cited and discussed. But there are some that remain more ambiguous in their contribution. 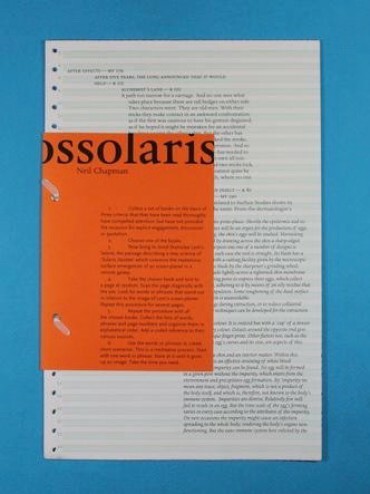 Inspired by Gilles Deleuze and Michel Foucaultʼs technique of ʻdiagonal readingʼ and taking Stanislaw Lemʼs Solaris as narrative context, Glossolaris proposes a new procedure for writing. The procedure draws on marginal research sources. Scenarios for a new book emerge. Like phenomena witnessed on the surface of a remote planet. This new book will not be written, but the scenarios exist as a plan.